Bionics is mechanical/electronic replacement or enhancement of organs/parts of living organisms. The medical bionic implant/artificial organs market is a potentially growing one with a global market of $12.67 billion in 2012. It is expected to grow at a CAGR of 7.1% to reach $17.82 billion in 2017. The global artificial organs market has been segmented as vision bionics, ear bionics, orthopedic bionics, heart bionics, and neural/brain bionics. Heart bionics accounts for the largest share in this market, primarily due to a large global population with heart diseases. Rising healthcare expenditure and emergence of new healthcare facilities in emerging economies provides growth opportunities for the medical bionic implants market. The market for certain bionic devices such as exoskeletons, bionic orthopedics, and the bionic eye are skewed in favor of certain regions because of stronger research in these regions as compared to others. In this report, we are also focusing on bionic devices in pipeline, which include wearable artificial kidney, bio-lung, and artificial pancreas. New and improved technologies, increasing organ failure owing to aging and age-related disorders, increasing accidents and injuries leading to amputations, and rise in number of people awaiting organ transplants are the major drivers slated to propel the growth of this market. However, a few pivotal factors restraining the growth of this market are high cost of devices and uncertain reimbursement scenarios in different regions, limited surgical expertise, and high cost of development. The opportunities in this market for new entrants include improving income levels, and rising awareness in emerging economies. North America dominates the artificial organs market in 2012, followed by Europe. However, the adoption of novel medical bionics as a therapy in emerging markets is gaining momentum at a fast pace due to a growing population and increasing awareness among patients and players. In addition, increasing healthcare expenditure, growing income levels, rising preference for bionics due to better and efficient recovery as compared to prosthetics, growing surgical procedures in lieu with medical tourism, and lesser competition than mature countries, have amplified the interest of market players in emerging markets. The key players in this market are Orthofix International N.V. (The Netherlands), Biomet, Inc. (U.S.), Medtronic, Inc. (U.S.), Cochlear Ltd. (Australia), Second Sight Medical Products, Inc. (U.S.), Ossur (Iceland), Ekso Bionics (U.S.), and St. Jude Medical, Inc. (U.S.). This research report categorizes the global medical bionic implants market on the basis of products, technologies, and type of fixation. These markets are broken down into segments and sub-segments, providing value analysis for 2010, 2011, and 2012, as well as forecast up to 2017. Each market is comprehensively analyzed by geography (North America, Europe, Asia-Pacific, and Rest of the World) to provide in-depth information on the global scenario. The term ‘bionics’ is analogous to the term ‘biomimetics’, which involves the study and development of artificial systems that replicate or mimic the functioning of natural biological systems. The science of bionics deals with the application of naturally found biological systems to the study and development of artificially engineered systems. The motive behind developing these artificial systems is to replace and enhance existing natural systems, which may malfunction or fail to function in a desired manner using either mechanical or electronic modalities. The medical bionic implants market is a potentially growing one with a global market of $12.67 million in 2012. It is expected to grow at a CAGR of 7.1% to reach $17.82 billion in 2017. 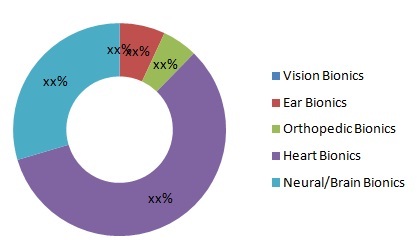 The global medical bionic implants/artificial organs market has been segmented as vision bionics, ear bionics, orthopedic bionics, heart bionics, and neural/brain bionics. Vision bionics consists of the bionic eye; ear bionics includes cochlear implants and BAHA; orthopedic bionics includes bionic limb, bionic finger, exoskeleton and electrical bone growth stimulators; heart bionics comprises of pacemakers, TAH, ventricular assist devices, and artificial heart valves; and neural/brain bionics consists of deep brain stimulator, vagus nerve stimulator, and spinal cord stimulator. Based on technology, medical bionic implants are divided into two groups - mechanical bionics and electronic bionics. In addition, depending upon the type of fixation, they are classified as externally worn and implantable. The artificial organs industry is under dramatic transformation globally and will witness significant changes in the coming years, primarily driven by innovation, globalization, and commoditization of products. Amputation, for instance, was considered equivalent to failure to salvage a limb; however, with the presence of advanced powered prosthetics, it is no more considered so. With the advent of bionic technology, amputees have access to limb replacements and enhancement. Orthopedic bionics is more scientifically advanced than prosthetics because it contains specific sensors that can sense and predict user action, based on his/her environment. Technological innovations in the medical bionic implants industry have been witnessed in the past few years. Newer products with better safety and efficacy contribute to the widespread adoption of medical bionics by physicians worldwide. However, a few pivotal factors restraining the growth of this market are high cost of devices, uncertain reimbursement scenarios in different regions, limited surgical expertise, and high cost of development. The penetration rate of medical bionics in emerging markets is low. However, established companies and new entrants in the medical bionic implants market should consider the GDP growth rates of these countries, ease of product approval, increasing procedural volumes, and low penetration rates compared to mature markets as factors that will drive growth in these regions. The key players in this market are Orthofix International N.V. (The Netherlands), Biomet, Inc. (U.S.), Medtronic, Inc. (U.S.), Cochlear, Ltd. (Australia), Second Sight Medical Products, Inc. (U.S.), Ossur (Iceland), Ekso Bionics (U.S.), and St. Jude Medical, Inc. (U.S.). 3.5.1.3 INCREASING ACCIDENTS & INJURIES LEADING TO AMPUTATIONS. 9.12 MED-EL ELEKTROMEDIZINISCHE GERÄTE G.M.B.H. 9.17 OTTO BOCK HEALTHCARE GMBH. 9.18 SECOND SIGHT MEDICAL PRODUCTS, INC.
9.20 ST. JUDE MEDICAL, INC.